The double crochet stitch is my crochet hook comfort zone. I can do other stitches, but I don’t see why I ever would. The double crochet is so damn versatile. 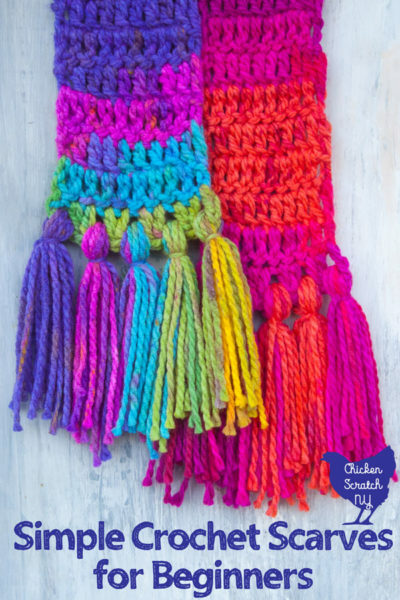 My go-to Christmas gift for years has been a simple crocheted scarf with fancy tassels that I can whip up in a few hours. Very important when you procrastinate and have a huge family. 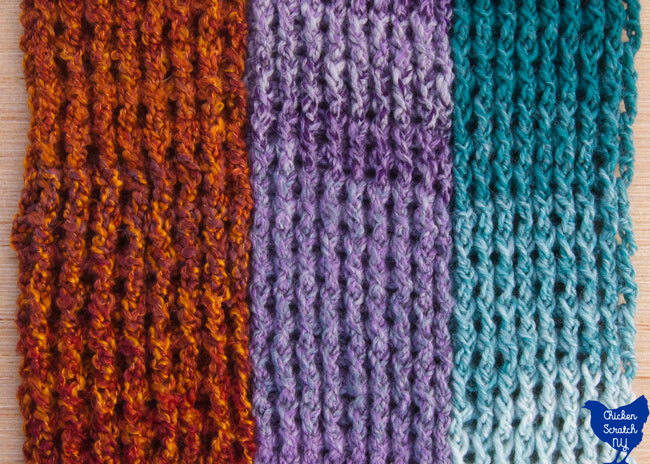 Those scarves rely on colorful chunky yarn to make then seem much fancier than they are. Then I went and fell in love with a new yarn, a thinner yarn. Scarfie yarn in Cream/Teal was a total impulse buy. 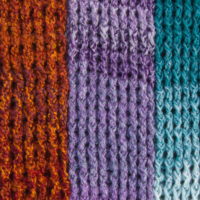 Scarfie yarn is an acrylic/wool blend available in 20 different ombre shades. The label classifies it as bulky, but I don’t believe them. It runs $10 for a ball, add a 60% off any item and you’ve got yourself a fancy $4 scarf. 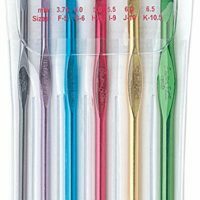 There is a variation in the thickness of the yarn as it changes colors. It has a very smooth transition from cream to teal and back. I tried to work it up in my basic scarf pattern but it wasn’t what I wanted. This yarn deserved more. After flipping through my trusty crochet book, a little experimenting and a lot of frogging I settled on a double crochet variation with crocheting around the post. 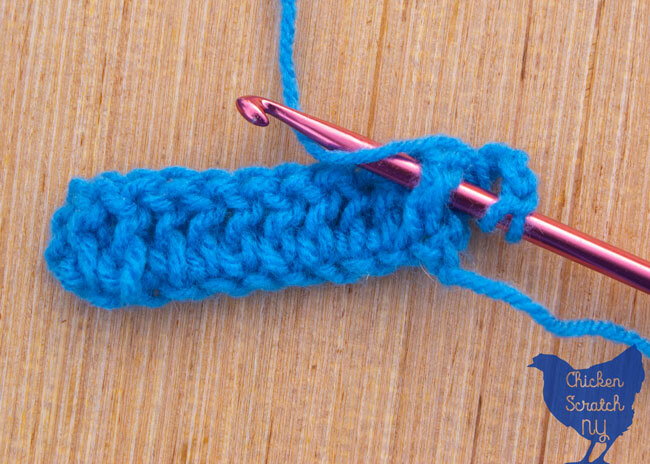 It’s not any harder than a regular double crochet but it looks a lot different. You end up with pronounced vertical ridges that look more like knitting than crochet. Which is great for ahem those of us who can’t knit but still like that look. Instead of going through the loops at the top of the stitches you go around the double crochets in the previous rows, aka the posts. By alternating between the front and the back you make scarf that looks the same on both sides. You’re going to be making a mesh of sorts, there with be vertical columns on the front and back with the horizontal rows running in between them. If you pull the scarf apart you’ll see exactly what I mean. 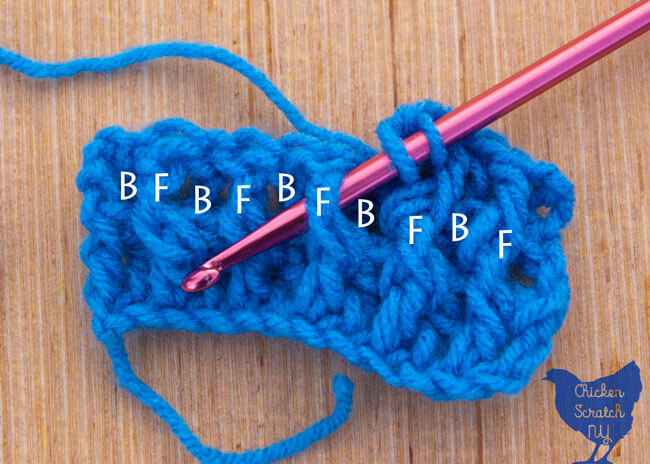 Start with a basic chain and a row of double crochet. At the end of the row chain 3. This creates the foundation for the pattern. Yarn over and pass the hook under the 2nd dch from the hook from the front, yarn over and pull the loop back behind the dch. You should have 3 loops on the hook. Finish the stitch. Yarn over and pass the hook under the 2rd dch from the hook from the back. Yarn over and pull the loop in front of the dch. You should have 3 loops on the hook. Finish the stitch. Working around the stitched pulls them forward (and backward) to make the vertical cables. It’s pretty and it also makes this an easy pattern to pick up and put down. You don’t need to count or keep track of where you are. If the dch is pushed forward, work from the front, if it’s pushed back work from the back. 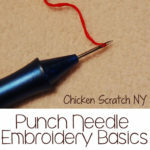 If you’re new to crocheting practice this stitch with Simple Saver or another basic cheap yarn. Working the dch from the back is tricky, it’s easy to drop the loop when you pull it through. Even after 3 full scarves I’m still dropping a stitch or two every few rounds. I find it easier to bend the whole thing forward when you’re working around the back posts. 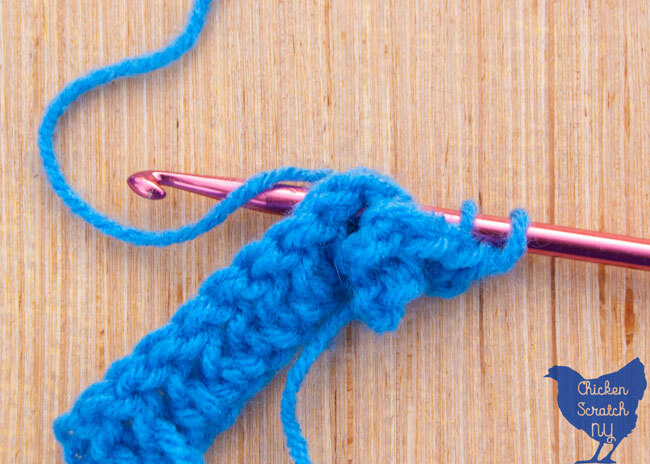 Once you’ve mastered crocheting around the post it’s time to make a fancy scarf. You can obviously use any yarn here but I’ve played around with this stitch in a few different yarns and I’m going to tell you what I’ve discovered. I think you get the best look from this pattern with a textured yarn and a loose stitch. We’re going for that cabled look and due to the nature of crocheting you’ll get obvious gaps on either side of the double crochet columns. A textured yarn hides the gaps between the stitches, especially if the yarn is a little fuzzy. The best thing about going around the post is that it’s so much easier than trying to find the correct loops with a fuzzy textured yarn. For example I have a love/hate relationship with Homespun yarn from Lion Brand. It’s soft and fluffy and warm but it has a funky loopy texture that makes it impossible to find the right place to put the hook for the next stitch. I made a scarf with Homespun in the color Wildfire. This scarf is super squishy and warm. The second scarf in the line up was made with Barcelona yarn by Loops & Threads in the color Quartz. I picked the purple shade with my mom in mind, it’s her favorite color and the scarf I made her was a few years ago (the pearl white Homespun scarf hanging on the fence in my double crochet scarf post). 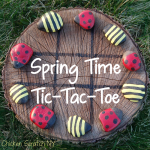 I love the yarn and I think the texture is perfect for this crochet pattern. But… I really don’t like the pattern. The ball of yarn itself is gorgeous it’s a range of gray, lavender and purple tones with a hint of blue. When you work it up it has very abrupt color changes, it makes very distinct blocks of color. But they’re very random and bother my brain. I prefer colors that blend into each other like on the cream and teal scarf. Keep that in mind if you’re checking out the Barcelona yarn at Michael’s. It was only $5 though, so not bad for a gift! The last scarf in the trio was crocheted with the Selfie yarn I mentioned in the beginning. You get a soft lacy look without being too delicate. It’s a pretty sturdy stitch so it’s fine for every day wear. 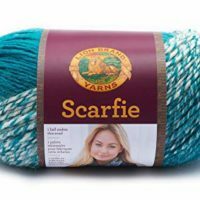 The one downside is that Scarfie is a wool blend, if wool bothers you you’ll need to pass on it. 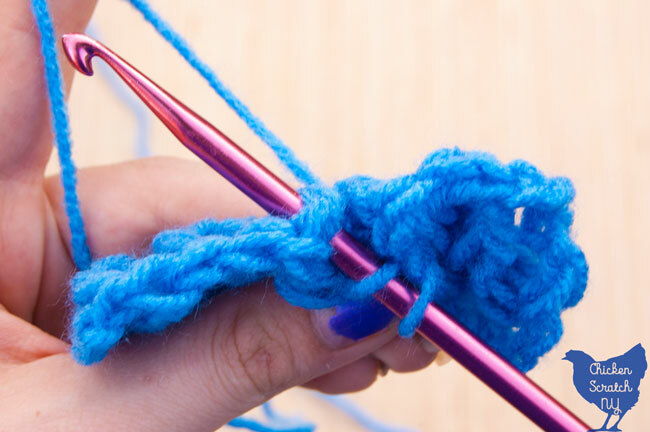 Take your beginner crochet skills to the next level by learning to crochet around the post. 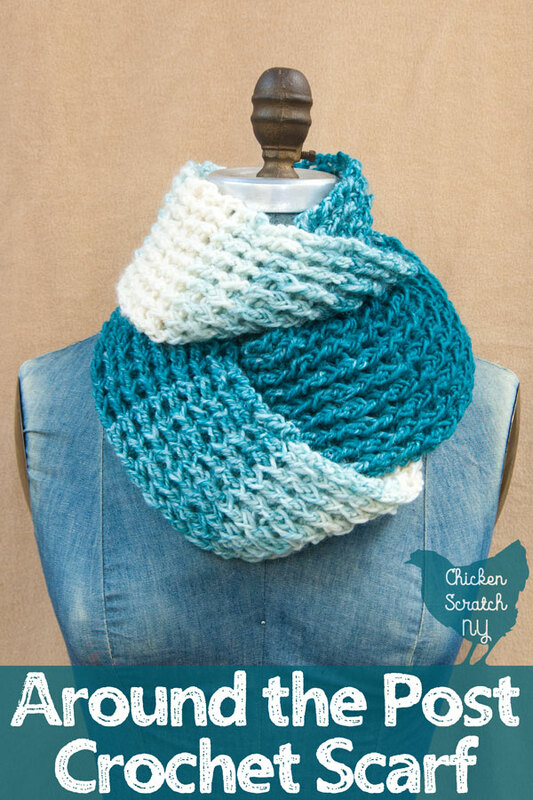 Turn any ball of yarn into a stunning cozy scarf in a few hours while you practice!